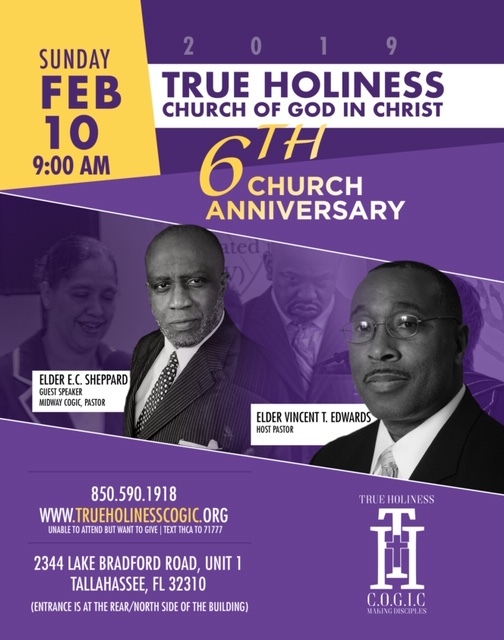 Come worship with us on Sunday, February 10, 2019 at 9:00 am as we celebrate 6 years in ministry. We would love for you and your family to worship with us as we give praises and thanks to God for what He has done for us this past year. Entrance to the sanctuary is at the rear of the building. If you are unable to attend, we ask that you please make tax deductible financial contribution to this ministry. You can give your gift by clicking here. Sign up today and receive the latest news and updates about True Holiness Church of God in Christ. Start Receiving Short Biblical Videos and Text Messages To Help You Grow Spiritually Today.